The following is a transcription of the War Diary of the Desert Column, of their role at the Battle of Rafa, Sinai, 9 January 1917. 1. By 1530 on the 8th January the mounted troops of the Desert Column will be assembled in column of Brigade masses facing east with the leading Brigade in line with the 1st Light Horse Brigade Headquarters on the Arish - Sheikh Zowaiid Road. The 5th Mounted Brigade leading, then the A & NZ Mounted Division following. The ICC Brigade (less 1 Company at Lahfan) in rear. (a) At 1600 the head of the main body will pass the 1st Light Horse Brigade headquarters and proceed by El Burj to Sheikh Zowaiid, moving in column of Brigade on as broad a front as possible. 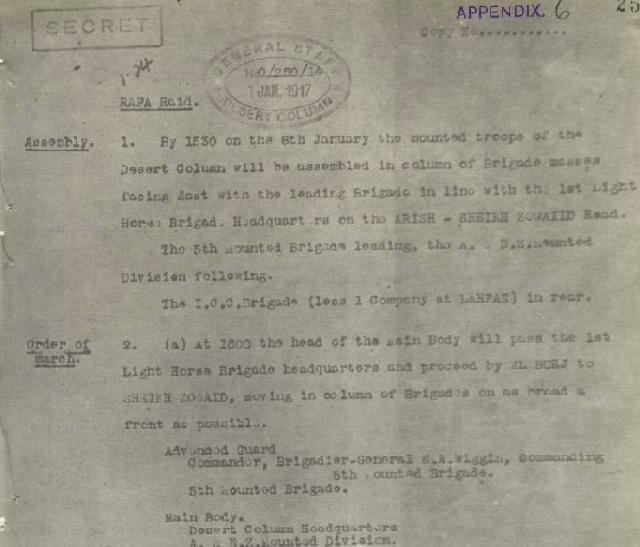 Commander, Brigadier-General BA Wiggin, Commanding 5th Mounted Brigade. (b) Baggage sections of 1st Line transport will join their own convoys, which will move off in rear of the DAC (Divisional Ammunition Column). GOC, 1st Light Horse Brigade will tell off 3 Officers who know the country about Sheikh Zowaiid to report to Advanced Guard Commander at position of assembly. 3. The rate of march will be such as to ensure the head of the Main Body reaching Sheikh Zowaiid by 2200. 4. On arrival at Sheikh Zowaiid a cordon will immediately be placed round the village by one squadron of the Advanced Guard Brigade and no communication whatever will be allowed to pass between the town and the surrounding country. This squadron will take up a line at least 2 miles east of the village and will remain in position until dawn when it will again be at the disposal of the GOC 5th Mounted Division. 5. At Sheikh Zowaiid the force will off saddle, and feed. 6. Troops will leave el Arish with their rations and forage for the 9th and will, on the conclusion of the operation, return to Sheikh Zowaiid where a convoy bearing rations and forage for the 10th will beet them. This convoy will be formed in two parts allotted to A & NZ Mounted Division, and 5th Mounted Brigade. Formations will be responsible for the provision of escorts and guides. 7. AA & QMC, A & NZ Mounted Division will be responsible for the allotment of watering areas and wells for men and horses on the return of the force to Sheikh Zowaiid. He will also allot bivouac areas about that place to be occupied by the troops on the night 9th/10th. 8. During the advance of troops the DDMS (Deputy Director Medical Services), Desert Column will arrange for the erection of EP tents for the accommodation of those wounded who are unable to return with the force to El Arish. 9. APM (Assistant Provost Marshal), A & NZ Mounted Division will make such arrangements as he considers necessary for the reception of such prisoners as may fall into our hands - until they can accompany the force back to El Arish on the 10th. 10 From 1400 till 1545 the RFC will patrol the air over the position of assembly to prevent hostile reconnaissance from observing the massing of the troops. 11. A staff officer from the A & NZ Mounted Division, 5th Mounted Brigade and ICC will report to Column Headquarters at position of assembly at 1530 to set watches.